These semi succulents grow best in poor soil conditions, and are especially suitable for the rock garden. This guide is about growing hens and chicks. Hen and Chicks are interesting, low-maintenance perennial plants that are rarely troubled by pests. They make wonderful houseplants, yet because they grow best in poor soil conditions, they are also suitable to almost any outdoor garden environment - especially the rock garden. Here's what you need to know to start growing them. Not everyone looks at these self-perpetuating plants and sees a central hen surrounded by tiny peeping chicks, but nonetheless, they are fascinating. 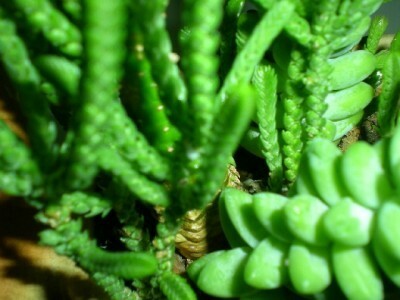 There are over 100 species of them, all of which form low, succulent rosettes of leaves. Some varieties grow only a couple of inches wide, while others spread into mats several feet across. The leaves may come in a multitude of shades from gray to green to burgundy, many with edges tipped in bright red, pink, purple, or even black. A few hairy varieties look as though a spider has spun its web over the top of the plants. Hen and chick's botanical name "Senpervivum tectorum", is more logical (and interesting). In Latin, Senpervivium means "always live" (i.e. evergreen) and tectorum means "on roofs". These plants are native to southern Europe, where they were (and still are) grown tucked into the corners of rooftops on Roman houses (without any soil) to hold the slate tiles in place. This explains the origin of their other common name "houseleeks." In the days when thatched roofs were common, houseleeks were thought to protect houses from lightening and subsequent fires. This idea isn't far-fetched given their succulent nature. Today, some green roofs are planted with these small plants to prevent runoff of rainwater, insulate the building, and encourage energy conservation. Hardiness: To zone 3 (depending on variety). Site: Prefers full sun but will tolerate light shade. Well-drained soil is a must and they will also grow readily in alkaline soil. Height (without flowers): 1 to 3 inches. Spread: 2 to 36 inches. Foliage: Forms clumps of fleshy-leaves, rosettes. They can be gray, rosy pink, or bright to dull red in color; some varieties are covered in silken white filaments called "cobwebs". Flowers: Upon maturity (usually around 3 to 4 years old) plants send up a single stalk from 2 to 8 inches tall with a cluster of star-shaped flower buds 1 to 2 cm. in diameter. Colors range from red, pink, or yellow and bloom for several weeks. Bloom time is from spring through fall depending on variety. After blooming, the "hen" dies and leaves behind many offsets ("chicks"). 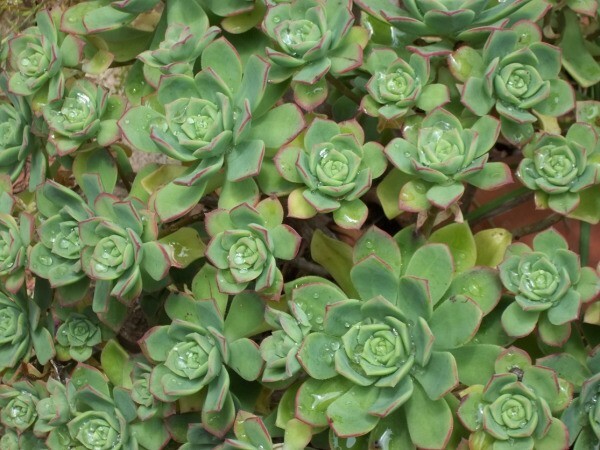 Watering: The succulent leaves of these plants are equipped to survive in dry conditions. Watering is only necessary in cases of extreme drought. 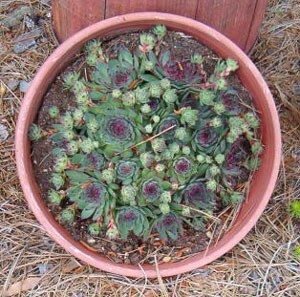 Fertilizing: Do not fertilize hens and chicks. The foliage colors are most vivid when these plants are starved for nutrients. Propagation: Division. Seeding is not recommended as these plants are very slow-growing and the seed is not readily available. Hens and chicks are readily available at garden centers in the spring. They are often sold featuring several different varieties within the same container. When setting out new plants, grow them at the same depth they grew in the pots. Contact with the soil should be sufficient for transplanting since hens and chicks root readily. Space plants 4 to 6 inches apart to start (large rosettes will require more room). If you misjudge the spacing and your chickens become overcrowded, don't worry! They are easy to divide. Unlike most perennials, hens and chicks can be divided at any time during the growing season. 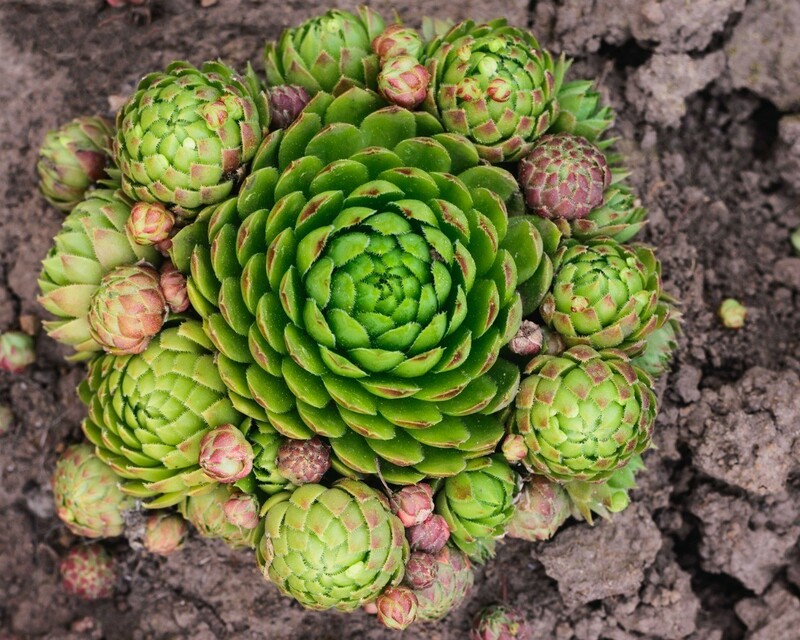 As tiny new plants (chicks) appear in a circle around the mother plant (hen), divide existing clumps by separating the rosettes and replanting them (the chicks will have their own roots). To transplant, just press the "chicks" gently into the soil in a new location. As the mother "hen" dies out, young "chicks' take its place and perpetuate a new crop. 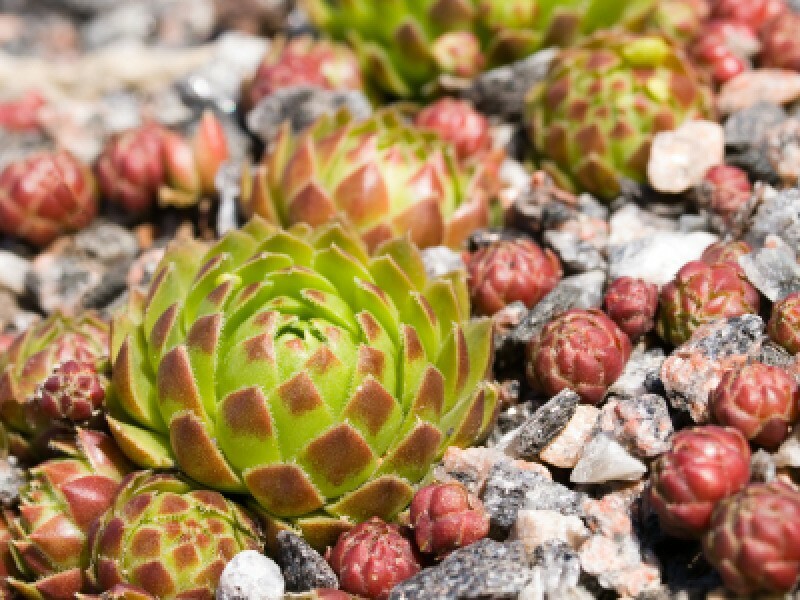 Hens and chicks thrive in hot, dry locations where other plants fail. They are ideal for rock gardens, trough gardens, edging borders, and wall crevices. They also grow well in containers. 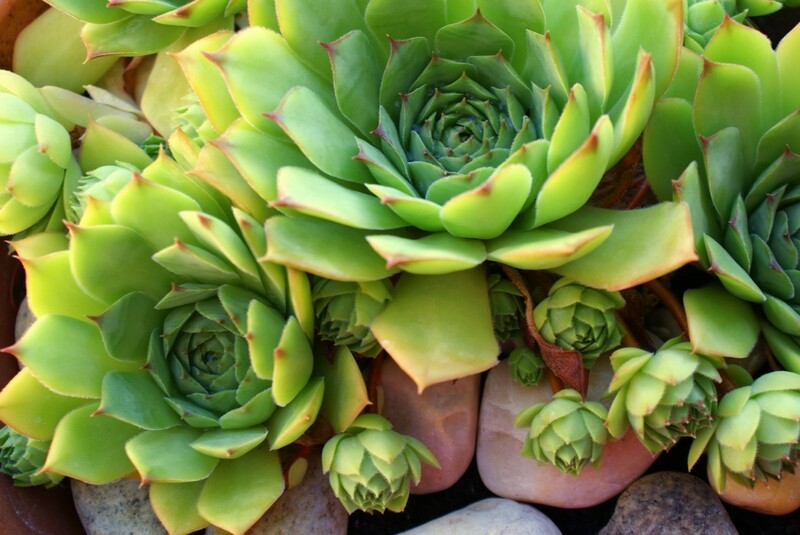 Once established, hens and chicks are extremely drought-tolerant. And while they make interesting ground covers, they will not tolerate any foot traffic. There are two other perennials that so closely resemble hens and chicks in both appearance and growing needs that you will probably only notice the difference when they are in bloom. 'False houseleeks' (Jovibarbas spp. ): These plants are easily distinguished by their lovely fringed petals. Some produce side-shoot offspring; with others, the rosettes divide themselves but remain attached to a central root stalk. These plants are known as "rollers", because during heavy rains, small rosettes often breakaway from the mother plant and roll off to another part of the garden. Wherever they stop, they will root and grow into another plant. "False Hens and Chicks" (Orostachys spp. ): This plant bears bizarre, pale yellow, elongated flower stalks, from 2 to 12 inches tall, that rise above the rosettes. This isn't a question but some info on hens and chicks. I was looking for info about when hens and chicks flower. I found a lot of questions here but no sure answers as to when and how. 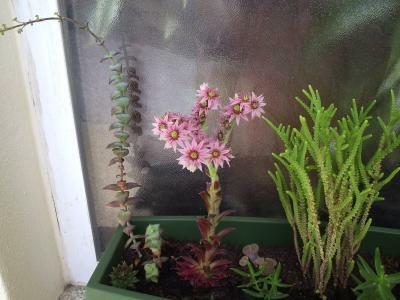 Question: Are Hens & Chicks Supposed to Bloom? Are Hens & Chicks supposed to bloom? I've had them for years, but mine have never bloomed before this year. Mine have done that too. I don't know if it just happens every set amount of time, say two years or four years, or if it has to do with how much water they are receiving. Now you have me curious! I think I'll google that and get back to you! Yes hens and chickens do bloom. Ditto. I had mine a number of years and they've only bloomed a handful of times. Mine have flowered, not every year, perhaps every 3 years. I also noticed that after flowering I soon have a multitude of chicks.....nature at its best!! I have has H&C for a number of years in a rock garden. And yes they do bloom, just not all of them at once :-) I usually notice that the ones that do bloom, die completely afterward. I have a house plant looks like a hen and chicks, but as it opens it has like cotton that spreads across it. I think it is called a spiderweb welock, but it seems to be slowly dying. I am not sure how to take care of it; I have tried everything. I sounds like a fungus to me. Is it getting enough air circulation? Sometimes, they will get a fungus without proper air. Take it outside and give it a good washing. Not the soil as too much water might kill it. Just a thought. Best of luck. I looked and looked online for an answer but to no avail. I had the same thing that happened to my bottlebrush succulent (native to Africa), I dipped the pointed part of a bamboo skewer into 1/4 cup water with a drop of dish soap and carefully pick the cottony pest, it becomes stringy when you remove it and it seems to control the pest whatever its name is. But if caught in advanced stage, may not work anymore. Is the web part of the plant? Some Hen & Chicks are naturally webby. If so, leave it alone and enjoy! Do be careful not to overwater, too. How can you plant hens and chicks in a garden and not water them when other plants need water??? I have some that have spider web type stuff over them... it's the way they are. Can I grow them in the full shade? No, not in full shade. They need partial to full sun. From gardeningknowhow.com Growing hens and chicks is easy. The plants are readily available in most nurseries. They require full sun and well drained, even gritty soil. Hens and chicks dont need much fertilizer and should rarely be watered. As succulents, hens and chicks plants are accustomed to very little water. Hens and Chicks will turn very pale green if grown in the shade and may eventually die but they can grow well if they even receive a few hours of sunshine. If all you have is shade then why not try your hand at growing them indoors? I got some hens and chicks last year. Now they look all brown and withered. When do they come back? How are you taking care of these? When raising chicken they need a special grain or seed. I feed our mostly corn. You can also feed them all your scraps from the peeling of potatoes, carrots, and stuff like this. I also feed ours cooked rice. Don't give them dry rice it is hard on them. They also need a lot of water. it is better if your cage is open on the bottom and they can scratch in the dirt for bugs and stuff. Your plants cannot be overwatered. They will rot. If yours are brown and withered, you may not be watering enough. Give them a deep drink and dont let them dry out. Would hen and chicks thrive in Tucson Arizona? My sister has many different varieties of cacti spread around her acre of land. I was thinking of hen and chicks up close to the house for her to enjoy without walking too far, or even out the window. Thank you. There is a white substance on my hen and chicks. I was wondering if they are mealy bugs and if dish detergent and water spray will stop the spread? We had an early morning spring shower that left the Hen and Chicks with droplets of water. When the sun hit them, they shimmered like diamonds. There are several Hen and Chick plants out on "The Path Garden" all of them looked so pretty that morning. This is a guide about transplanting hens and chicks. 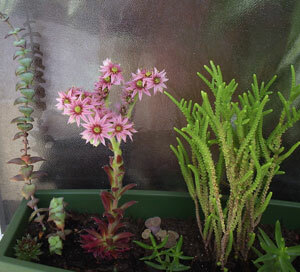 It is very easy to divide and transplant these succulents. 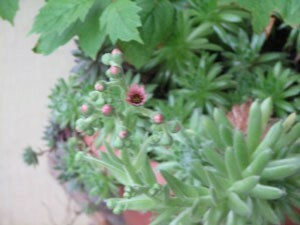 The other day a reader asked if hens and chicks bloomed. Well, I guess they do because mine bloomed this year, too. I think they're so pretty.